RANDOM: ATOMICDEATH/BLOODSTONE "Hellish Nuclear Destruction"
Back for it again, ATOMICDEATH bombed us with another release, this time with the Singaporeans BLOODSTONE. A thrash Metal split, obviously. 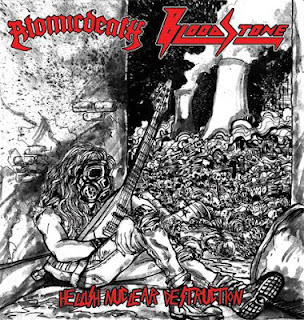 ATOMICDEATH wasted no time restarting what they have unfold in "Missile Massacre", glorious feast of simplified Slayer-esque thrash Metal with rigid underground Metal spontaineity. They sounded a bit more direct on the thrashing approach here, not even an ounce of that hunger being left out. I have nothing much to complaint about them, furthermore with the local scene nowadays with its sudden surge of thrash Metal inclined bands, I'll pick ATOMICDEATH out from the bunch without a single regret. So please, give us more of that plutonium digesting gesticulated Metal, no problem. BLOODSTONE is the more crude version of thrashing madness here, more chaotic, more primitive too. Probably leaning more on the European side of it I think. BLOODSTONE is just, alright to me. They done it quite good I think, but perhaps lack that compositional edge the ATOMICDEATH guys have in abundance. If this split is a war, then ATOMICDEATH is the victor, with considerable margin I might add.